Himmat Rai, who scored 70, 71, and 69 in the first three rounds respectively, got a 72-hole total of 10-under 278 at the Damai Indah Golf, BSD course. The 28-year-old Delhi golfer was nine shots behind joint leaders Tran and Lam till the regulation play. 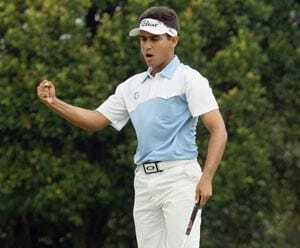 Indian golfer Himmat Rai scored four-under 68 in the fourth and final round to finish tied 22nd, while Michael Tran of Vietnam won his maiden Asian Development Tour (ADT) title after defeating Lam Chih Bing of Singapore on the first play-off hole of the $100,000 Ciputra Golfpreneur Tournament here on Saturday. Himmat, who scored 70, 71, and 69 in the first three rounds respectively, got a 72-hole total of 10-under 278 at the Damai Indah Golf, BSD course. The 28-year-old Delhi golfer was nine shots behind joint leaders Tran and Lam till the regulation play. Tran, who was one shot off the pace heading into the final round, signed for a four-under 68 after sinking a crucial 15-footer birdie putt on the last hole to force a play-off with Lam, who bogeyed the hole for a 69. The duo were tied on 18-under 270 total in regulation play before returning to the par-five 18th for the play-off battle where Tran outplayed Lam with a birdie against a par. Tran, 25, became the first Vietnamese to win on the ADT. It also marked his second professional win since turning professional in 2008. Thailand's Sutijet Kooratanapisan, who held a share of the overnight lead, settled one shot back in third place with American Jarin Todd after signing for rounds of 70 and 68 respectively. Panuwat Muenlek, also of Thailand, took the fifth place on 273 following a 71. Singapore's Mitchell Slorach (67) and Thailand's Atthaphon Sriboonkaew (70) shared sixth place on 274.